Transparency Market Research (TMR) has published a new report titled, “Medical Nonwoven Disposables Market - Global Industry Analysis, Size, Share, Growth, Trends, and Forecast, 2018–2026.” According to the report, the global medical nonwoven disposables market was valued at US$ 13,620.0 Mn in 2017 and is projected to expand at a high CAGR of 3.9% from 2018 to 2026. Rise in prevalence of hospital acquired infections across the world is anticipated to drive the global market during the forecast period. North America is anticipated to dominate the global medical nonwoven disposables market during the forecast period. 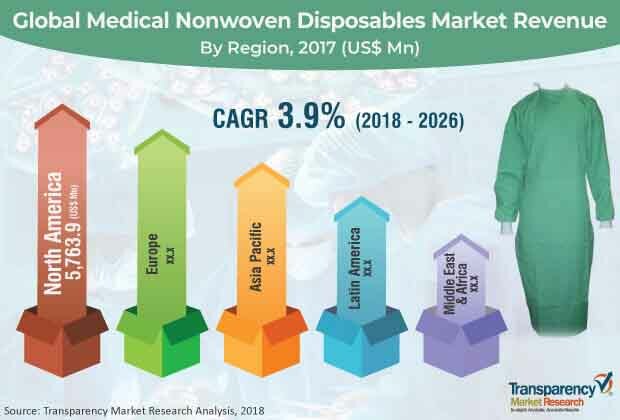 The market in the region is driven by high adoption of medical nonwoven disposables due to its advantages over traditional woven medical disposable products. The market in Asia Pacific is expected to expand at a high CAGR from 2018 to 2026. The medical nonwoven disposables market in Europe is expected to expand at a moderate CAGR during the forecast period. The market in Latin America is likely to grow at a moderate pace from 2018 to 2026. In terms of product, the global medical nonwoven disposables market has been segmented into surgical products, wound dressings, and incontinence products. The surgical products segment has been classified into drapes, gowns, caps, masks, and others. The wound dressings segment has been categorized into bandages, tapes, post-operative wound dressings, operative wound dressings, and dressing pads. The incontinence products segment has been bifurcated into under pads diapers and diapers. Technological advancements in health care is a major factor driving the surgical products segment. Drapes are the widely used surgical products, followed by gowns. The gowns, caps, and masks segments are expected to expand at high CAGRs during the forecast period. The wound dressings segment is expected to be driven by rise in government initiatives for the manufacture of nonwoven medical surgical products. Based on material, the global medical nonwoven disposables market has been segmented into polypropylene, polyethylene, acetate, rayon, polyamides & polyesters, acrylic, and others. The polypropylene segment accounted for largest share of the global market in 2017. The segment is projected to be driven by increase in adoption of medical nonwoven disposables in developing countries such as India, Brazil, China, and the Philippines. The polyethylene segment is anticipated to account for the second largest market share during the forecast period. The segment is expected to be propelled by increase in demand due to cost effectiveness of the material in the manufacture of medical nonwoven disposables. For example, demand for smart fibers for the treatment of wounds and ulcers is rising. These fibers (polypropylene and polyethylene) also provide higher degree of protection against infections from bacteria and viruses and are more comfortable. In terms of end-user, the global medical nonwoven disposables market has been segmented into hospitals, nursing homes, consumer & home health care, clinics, and ambulatory surgical centers. Hospitals was the largest segment of the market in terms of revenue in 2017, followed by ambulatory surgical centers and nursing homes. Demand for technologically advanced medical nonwoven disposables is high in ambulatory surgical centers, as these provide increased barriers against contaminants and help in containing spread of infection. Additionally, rise in number of surgical and treatment procedures such wound dressing which are conducted in ambulatory surgical centers fuel the growth of the segment. Currently, there are approximately 5,400 Medicare certified ambulatory surgical centers in the U.S. Nursing centers in developing countries are rapidly using nonwoven medical disposables to prevent spread of infections. Rise in awareness regarding personal hygiene is expected to boost the growth of the consumer & home health care segment during the forecast period. In terms of region, the global medical nonwoven disposables market has been segmented into North America, Europe, Asia Pacific, Latin America, and Middle East & Africa. North America dominated the global market in 2017 and the trend is projected to continue during the forecast period. Increase in the number of mergers and acquisitions and technological advancements are the major factors contributing to the growth of the market in the region. Europe was the second largest market in terms of revenue in 2017. The market in the region is driven by increase in technological advancements and rise in adoption of medical nonwoven disposables. The market in Asia Pacific is expected to witness strong growth during the forecast period due to increase in disposable income and rise in population in countries such as China, India, and Japan. Surge in government expenditure on health care is also a major factor boosting the growth of the medical nonwoven disposables market in Asia Pacific. International trade development and improving economic condition across countries in Latin America and Middle East & Africa is likely to augment the market during the forecast period. The global medical nonwoven disposables market is fragmented, owing to the presence of several small and large companies. However, the market is dominated by a few major players with strong global presence. The report provides profiles of leading players operating in the global medical nonwoven disposables market. Key players in the market include Kimberly-Clark Corporation, Medline Industries, Inc., Mölnlycke Health Care, Paul Hartmann AG, Ahlstrom-Munksjö, Medtronic plc, Asahi Kasei Corporation, Freudenberg & Co. KG, Essity AB, and Domtar Corporation.